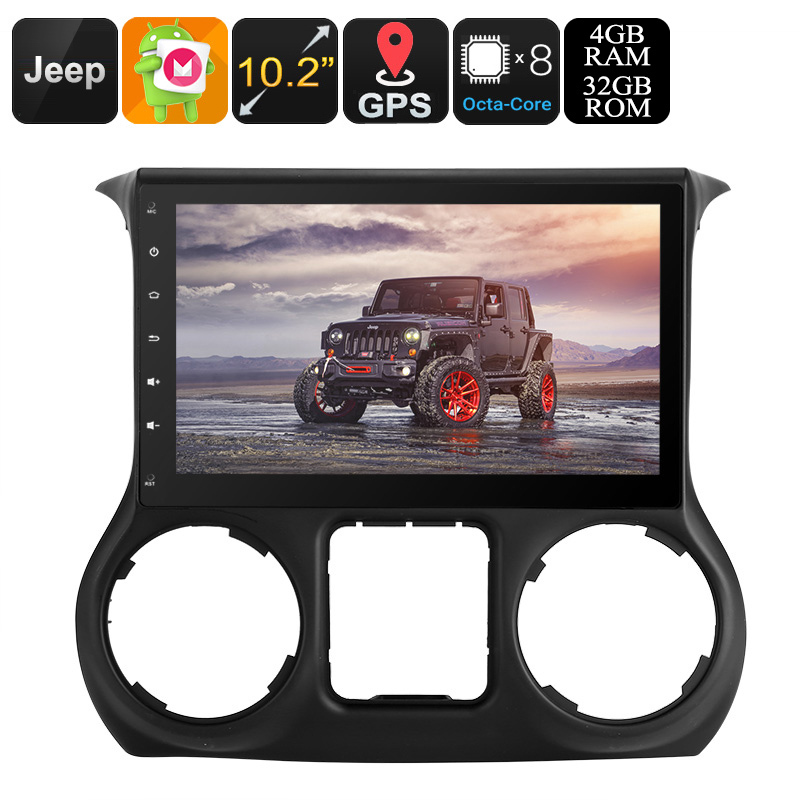 Successfully Added One DIN Android Media Player - For Jeep Wrangler Left Hand Drive, 10.2 Inch, CAN BUS, Android 8.0.1, Octa-Core, 4GB RAM, GPS to your Shopping Cart. This amazing 1-DIN media player for your Jeep Wrangler offers you the perfect way to upgrade your car. It lets you bring hours’ worth of fun and entertainment into your vehicle. From now on, your passengers will always be able to watch movies and series during your upcoming road trips. This offers a perfect way to keep your kids and friends entertained while driving towards your upcoming destination. It runs on an Android 8.0.1 operating system that lets you enjoy the latest software features available. Thanks to its WiFi support, you’ll be able to browse the web and download your favorite media straight from your dashboard. Besides all its entertainment options, this Android media player supports a highly-accurate GPS navigation system. With this Navigator at your side, you can be assured that you’ll never get lost again. Thanks to its 20-channels and porcelain antenna, it is capable of treating you with accurate readings on your position anywhere on the globe. Simply insert the Android maps of your liking via your TF card slot and you’ll always find the fastest way to your upcoming destination. This One DIN Media Player comes with a massive 10.2-Inch display. On this HD screen, it will display crisp HD images in 1024x600p resolution. Thanks to this, you’ll be able to enjoy all media in vivid color and stunning detail. You’ll be treated with a cinematic experience straight into your car. The next time you head out on a trip abroad, you’ll always be able to take along your favorite films and series to enjoy. Additionally, you’ll be able to browse the web and play games. Nothing is impossible with this Car Android Media Player. Its 64GB SD card slot and USB input allow you to insert plenty of external media. Thanks to this, you’ll never have to be bored again during your future camping trips. Behind its large display, this 1 DIN Media Player holds a powerful Octa-Core processor. This chipset has been clocked at 1.5GHz and brings forth a smooth user experience. Your car media player furthermore comes with 4GB of RAM. Together, this hardware lets you enjoy the latest and demanding software anywhere you go. Thanks to its CAN BUS support, you’ll be able to use all its basic controls via the buttons on your steering wheel. This brings along great efficiency. This One DIN Media Player comes with a 12 months warranty, brought to you by the leader in electronic devices as well as wholesale electronic gadgets..